A fantastic looking bike comes complete with an aftermarket exhaust and colour coded engine bars. Just 15,543 miles on the clock and fully Hpi clear. The most popular 125 cc on the market, call today to avoid missing out on this eye catching 125. 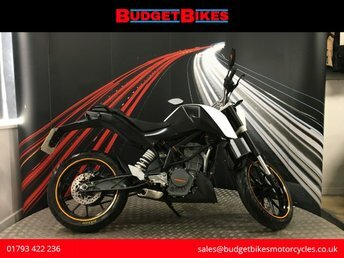 A fantastic 125 cc bike with bags of attitude and a comfortable riding position. This great bike is fully Hpi clear and has 22,000 miles on the clock. Early service history is included along with lots of bills for previous works carried out. 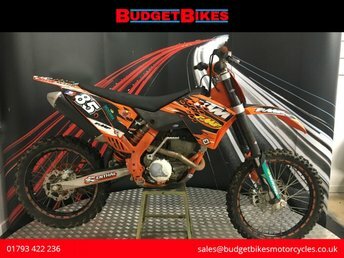 Budget Bikes are pleased to offer for sale this KTM SX-F 250 that will be absolutely fantastic fun for its next owner! A fantastic Duke 125 comes fully Hpi clear and standard through out. The best components in the best looking package on the market. This 15,000 mile bike won't be here long, call today to avoid missing out. WINTER SALE IS NOW ON. HUGE SAVINGS ACROSS THE STORE. 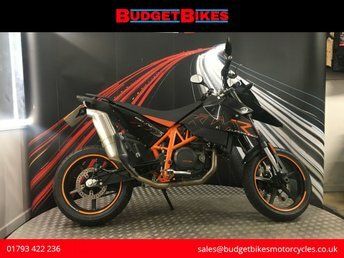 Budget Bikes are pleased to offer for sale this KTM RC125 that is HPI clear and documented for its next owner. 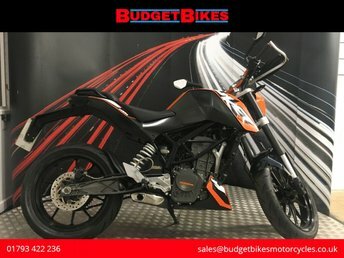 This 1 owner bike has covered 7,773 miles and comes with 2 keys and a KTM bookpack which includes its owners manual. A fantastic slice of fun from KTM. This great 950 supermoto come fully Hpi clear and sounds incredible with a set of Sp Engineering exhausts. Mot'd until March 2020. A fantastic supermoto with just 13,000 miles on the clock. Fully Hpi clear and standard through out. Complete with the original owners manual and service book. A stunning Supermoto with a sound that nothing else on the road will match. An Akrapovic can means this bike will stand out, and a fully Hpi clear report will give piece of mind. Last serviced just 2,000 miles ago and in great condition. Mot'd until December 2019. 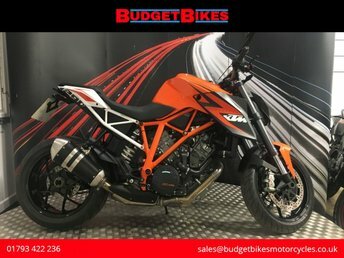 A legendary name in the world of motorcycling, Austrian manufacturer KTM is highly regarded thanks to its reputation for producing solid off-road bikes that are built to perform under the toughest conditions. 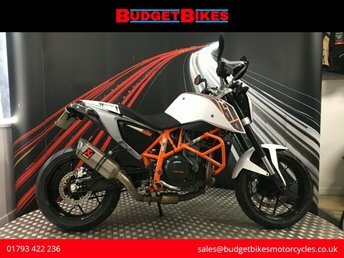 If you're in the market for a used model from KTM's Enduro, MX or Sports Tourer ranges, the team at Budget Bikes Ltd will be able to help. We're a leading supplier of quality used KTM motorbikes in Swindon and we'll do everything possible to help you source the right bike to fit your budget and riding requirements. Every used bike we sell is competitively priced and is fully inspected prior to going on sale. Get in touch with any questions or start by viewing our latest stock here on the website.